Description:2 glass vases, one acrylic and 1 table runner are included for rental in this exotic and modern design. 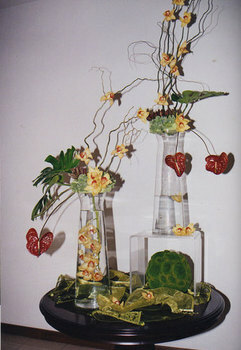 The flowers included are Cymbidium Orchid, Anthurium, Bells or Ireland, Safari and other greens and branches. Colours can be changed.